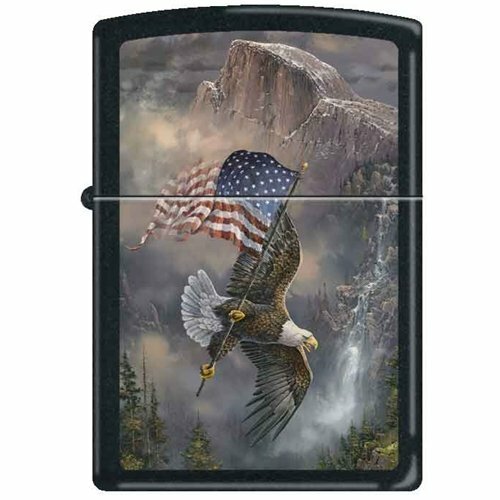 Old Glory at Half Dome American Patriotic Zippo Lighter by Ted Blaylock-About the artist: Born in the foothills of the Ozarks, Ted Blaylock grew up in the St. Louis, Mo. area. During his early adult life, Blaylock held a variety of tough jobs, all far removed from the art world. However, throughout this period one common thread remained: the love of art. Regardless of the job, his leisure time was spent developing his talent to draw and paint. Basically self-taught, Blaylock set out for a full time career in 1965 and opened his own art studio and gallery in Collinsville, Illinois in 1969. In 1972, the Blaylocks headed west to Arizona to exhibit and further his art career. For the past thirty years, Blaylock’s art has enhanced collectors’ walls in many different states and abroad. His national reputation in the art world is greatly respected. His art has been published worldwide and he supports such worthy conservation organizations as Ducks Unlimited, National Wildlife Federation, Pheasants Forever and many others. Blaylock Art was selected for the 1990-91 Arizona Duck Stamp and Arizona Lifetime Trout Stamp in 1994. His print of a South Bald Eagle family in the Salt River Canyon has helped raise funds for the Arizona Nest Watch Program. He was selected to show with the top one hundred Arts for the National Parks and Birds in Art, at Leight Yawkey Woodson Museum. He also has a painting on permanent display in the Leaning Tree Museum of Western Art. These are a few of the many milestones of his career. His prints are found worldwide with many sold out editions to his credit, and with originals in many of the finest collections in the country.